There's always plenty of cellar work to be done in the winery. As the wines are in barrel or tank, gravity helps clarify the liquid as protein, polysaccharides and to some extent, pigments, settle to the bottom of the aging vessel. Dead yeast cells are a part of this sedimentation. 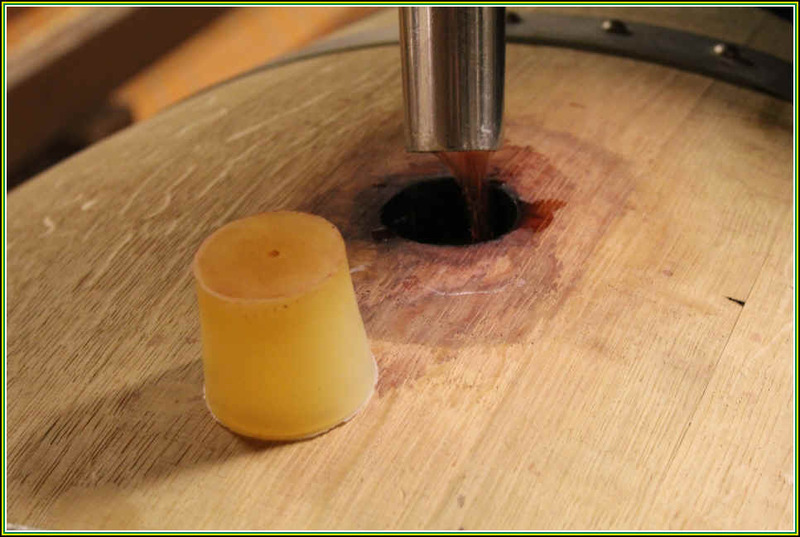 Winemakers will periodically move the wine off the sediment into a clean tank or cooperage. This transfer process is referred to as "racking." 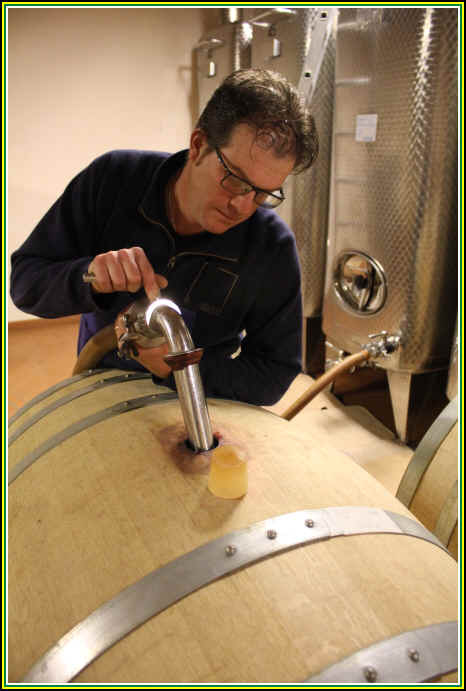 In this week's photos, a cellar worker is refilling a wood barrel having previously racked the clear wine off its sediment into that stainless steel tank you see in the photo below. As there can be "barrel variation," racking the wine into a large format tank helps create a more homogeneous batch of wine. It was a busy week as people are preparing for the spring holidays of Easter and Passover. We tasted a lot of new wines and found some new vintages of old favorites to be quite good. As usual we tasted wines carrying elevated price tags and we wonder what qualities in those bottles warrant such high prices. Of course, many times the premium price is the result of the idea that if a wine costs more, it must be of higher quality. And there are people who buy into this notion and are willing to spend a lot of money thinking the wine has to be superior. One winery rep was a bit disappointed we didn't find their allegedly "dry" wines to be without some sugar. The claim was the wines had high levels of acidity, rendering the sweetness undetectable. We tasted a really good Italian white made of an obscure grape from an unheralded location...that'll be arriving soon, too. Meanwhile, we're working to update entries on some of the Italian cellars we visited a few weeks ago and create new entries for some wineries we visited for the first time. Stop by and have a look...we'd love to give you a little "tour." There's a new newsletter on the counters...stop by and pick up a copy. Lots of interesting wines to taste today, as well. The list has been updated, so stop by and check it out. 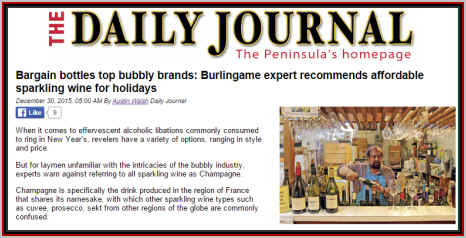 Australian Wine Writer Jim McMahon wrote a nice article published on the web site of the New South Wales Teachers Federation. Did you see the article in the local newspaper, by the way? "Quality first" is our mantra. As professional wine scouts, we navigate the vast ocean of offerings to find exceptional wines and exceptional values. We look for good wines which have "soul." Given that so many consumers are willing to settle for mainstream, mass-produced wines, our selections often come from off-the-beaten path locales and, we suppose, are not for everyone. But if you have taste for good wines, stop by the shop! They start at about five bucks and go up from there. We take the guess-work out of buying wine. By the way, the four of us here are not "on commission." Some stores offer incentives for the sales staff. We are dinosaurs in the wine business. Weimax has been open since 1961 and Gerald has been in the business long enough to remember when young, upstart wineries such as Caymus and Stag's Leap Wine Cellars opened their doors and charged all of $3.75 a bottle for Napa Cabernet! If you buy wine because it has a cute label or was given a 90-point score by someone, we're probably not your wine outlet. If you think you're really getting a deal buying a second bottle of some over-priced plonk for a nickel, we're probably not your wine outlet. If you're impressed by a huge selection featuring hundreds of factory-made wines of mediocre quality, we're probably not your wine outlet. If you think you're really getting a deal at the grocery store with inflated prices on their wine to give you a hefty percentage discount, we're probably not your wine outlet. If you like wines made by the winemaker and not marketing department geniuses, we have some interesting bottlings for you. If you're looking for wines which "taste more expensive" than they cost, we have many discoveries to share with you. If you're interested in broadening your enological horizons, stop by and have a chat! This site is a "work in progress." It is updated regularly. We are wine lovers and write this for wine lovers. We offer a large selection of wines for tasting Monday through Saturday in The Tasting Room. We also organize formal, blind-tasting comparisons. There is a growing archive of tasting results, so you might check that out while you're viewing this site. Those of legal drinking age are welcome to peruse this site. We do not purchase wines on the basis of favorable reviews by various publications. If you're looking for numerical scores of wines, you won't find them here. Unlike about 98% of Wine Shop sites, we write our own copy based on personal opinion and first-palate tastings. This is a Parker-Free and Wine Spectator-Free Zone. We hope this site will encourage you to stop by our shop and peruse the incredible selection of wines in store. SHIPPING AVAILABLE ALONG THE WEST COAST. $9 for the Box (12 bottles) , $23 for UPS. $5 handling per box for gift orders. No Shipments to Utah, Massachusetts or New Jersey, please. Non-California residents are responsible for determining whether they may lawfully import alcoholic beverages into their state. We make no representation relative to your right to import wine or spirits into your state. Each state has its own rules about alcoholic beverages. Better check before calling us with an order. We are not responsible for shipments damaged due to weather. Next day air or 2nd Day Air shipments are routinely handled with more care, so you may wish to request those services. We are not responsible for the weather (like, duh! ), so shipments to places with extreme temperatures are a risk. We will not assume that risk. Wine Tasting Room is Open Daily! the 2012 Heitz Trailside Vineyard Cabernet from Rutherford. It was matured for about three years in French oak and displays a marvelously exotic woodsy fragrance and flavor. Small Print: One free taste per household...one free taste of a particular wine per person. HEY! We were listed amongst Food & Wine Magazine's 125 "Favorites" in the October 2003 Issue. Contact the Chief Cook & Bottle Washer, Web-Mister & Wine Meister. We built this site ourselves using Microsoft's Front Page. We "upgraded" to a new Microsoft program called Expressions...big mistake! view Microsoft with derision, much like wine drinkers look down their noses at Gallo. Bob was in reasonably good shape in his later years. In early November he had a "dizzy spell" but said the hospital tests were all fine. Two weeks later he apparently suffered a stroke or seizure and ended up in the hospital. A series of further setbacks ensued and Bob passed away on Thanksgiving Day of 2012. He was a bon vivant, world traveler and gourmand. He appreciated art and photography, was a mushroom hunter and good cook and genial host. 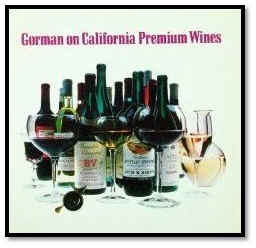 Bob wrote a book on California wine in the 1970s, a series of nice essays on various varietals, with commentary on various wines and various food affinities. Bob was especially proud that his book had been panned by The Wine Spectator, while garnering good reviews from Gourmet Magazine's wine guru, Gerald Asher. Julia Child also had been a fan of Bob's book, apparently. He is greatly missed by Weimax regulars and his colleagues behind the counter in the shop. 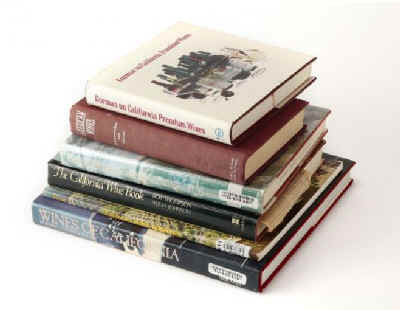 Jon Bonne, of the San Francisco Chronicle, wrote a nice article on "old" wine books. The March 2014 article featured a photo of a bunch of Jon's favorites, topped by Bob's tome. Read Jon's article by CLICKING HERE.